I, of course, haven’t hidden the fact that I’m a Mets fan. Nor have I made any attempt at being discrete in my distaste for the Yankees. 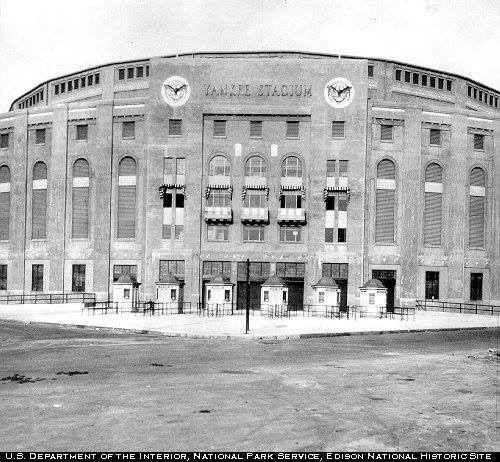 The olden days, with obstructed-view seats and the facade. However, I have a deep appreciation for baseball, for the game and its history and for the dichotomy of how the game can be so simple — throw, hit, run, safe or out — yet so intricately complicated — infield fly, double-switch, hit-and-run. 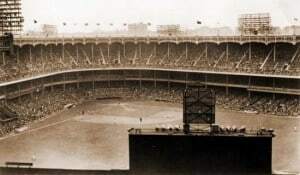 I love looking at the sepia-toned or black-and-white images of baseball played only during the day (and, unfortunately for too long, only by white men) and I have it in my mind to establish a modest collection of black-and-white photographs of old ballparks. But that should probably wait for a new home and more wall space on which to display such an exhibition. 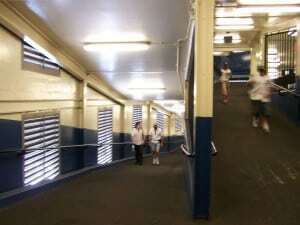 I love going to Wrigley Field or Fenway Park not just for the baseball and the talent on display these days, but for the unique feeling — the icky, sticky feeling of layers of paint slathered over decades-old concrete tunnels and iron railings and the overhanging upper decks and small, darkened concourses. When walking into those ballparks, I feel like I’m walking through history, entering a structure that has been standing for 90 years. I get the same sense navigating Yankee Stadium’s tunnels, only the sensation leaves me the moment I walk out into the sunshine and see all that gleaming blue and find myself enclosed in a behemoth of a ballpark. Yankee Stadium was renovated in 1976, the same year I was born, so I didn’t get to experience it as a 50-year-old relic, a monument to the dynasties and the days of Ruth, Gehrig, DiMaggio and Mantle. 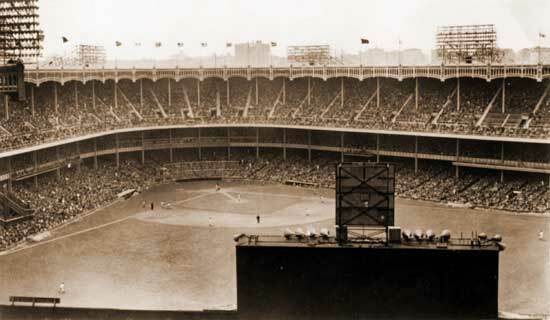 I don’t know how it looked with Death Valley to left-center, what the original configuration looked like or just how much ground the Yankee Clipper had to cover. I’ve only known it as the home of Mattingly, Winfield, Pagliarulo, Bernie and Jeter. Yet I can appreciate the need to give Yankee Stadium the All-Star Game in its final season. But to me, it’s a 1970s multipurpose stadium since converted to full-time baseball use. It’s not the dump that Shea Stadium is — though I do love every trip to Queens, particularly because I don’t have to fight off too many urges to overindulge on lukewarm food and overpriced crappy beer — but it’s not far off. I’m sorry, but I just don’t get that nostalgic, historical feeling when I walk in, and no amount of camera angles or new black-and-white shots can change that. Way out in left field. 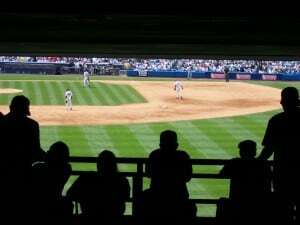 Nearly two years ago, I used a day off I had during the week to go to a Yankees-Devil Rays matinee. (It turned out to be the last time Carl Pavano pitched at home for the Yankees — June 22, 2005.) Though no plans had been announced yet for a new ballpark, my intentions were to take my camera to spend some time shooting the nooks and crannies, capturing the intricacies of a classic ballpark before its days are numbered. They are, of course, now numbered — two seasons, 162 scheduled regular-season home games, plus an undetermined number of postseason contests are all that remain before the new ballpark opens in 2009. Finding the historic, old-timey corners is what I was hoping to accomplish, but in my long absence, I’d forgotten just what the park actually looked like. It had been a couple of years since I’d been to the ballpark in the Bronx, and so my memories of it were not consistent with current reality. For one, I hadn’t yet been to a post-9/11 game at Yankee Stadium, so I found that I had to consult a certain member of the security detail at a certain gate in order to bring my camera bag inside. Arriving just as the gates opened for batting practice, I was dismayed by two new discoveries. First, the line for Monument Park — which I’ve never visited in all my trips — was way too long to allow for an enjoyable, leisurely look while still leaving time to enjoy batting practice. I can remember games in the 80s when there was no line and it appeared that you had more than enough time to take in all the plaques that are on display. Soon to be a new stadium over that way. 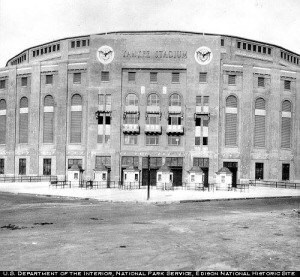 Anyway, Yankee Stadium is far from what it was, not that I ever knew it that way. I wish I did. Instead, I can only look at the past in photographs and try my best to compose shots I can enjoy whenever I make it back there myself. 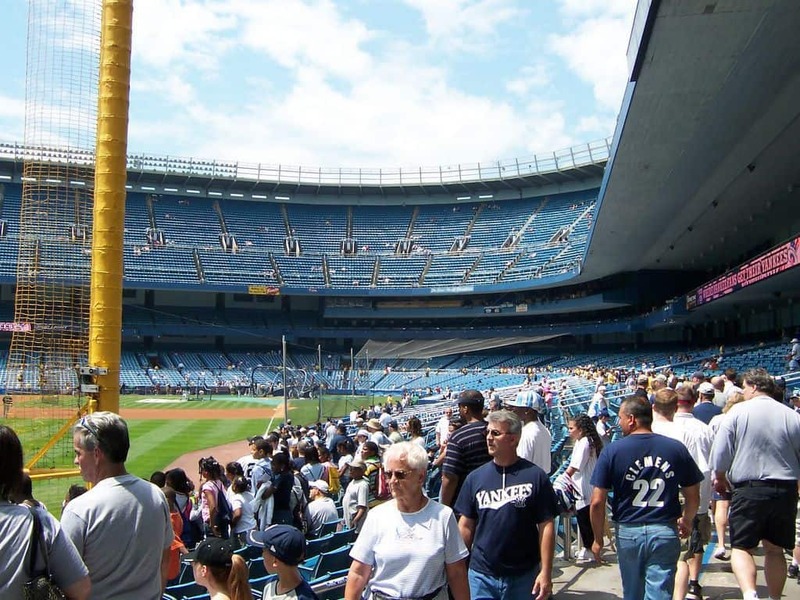 But I look forward to exploring the new ballpark, which will be given a classic look, complete with elements from the original Yankee Stadium design. It barely looks like the same stadium. The entry way is what I’m most interested in. It once had a grand facade out front, a towering, regal welcome area that, I imagine, seemed to announce you were entering some place special. Now, you approach from a parking garage with a skywalk over the underwhelming plaza. So many of the fans there today know less of this grand stadium’s past than I do. The kids have grown up knowing nothing but Derek Jeter, Mariano Rivera and division titles. They’re spoiled, actually. In the 80s, the Yankees were regular outdrawn by the Mets, and it’s almost unbelievable that Yankee Stadium never saw 3 million fans pass through its turnstiles in one season until 1998. And who knows how many fans would’ve showed up for a Sunday afternoon game against the Twins were it not for a Beanie Baby giveaway; otherwise, who knows how packed the park would’ve been for David Wells’ perfect game. 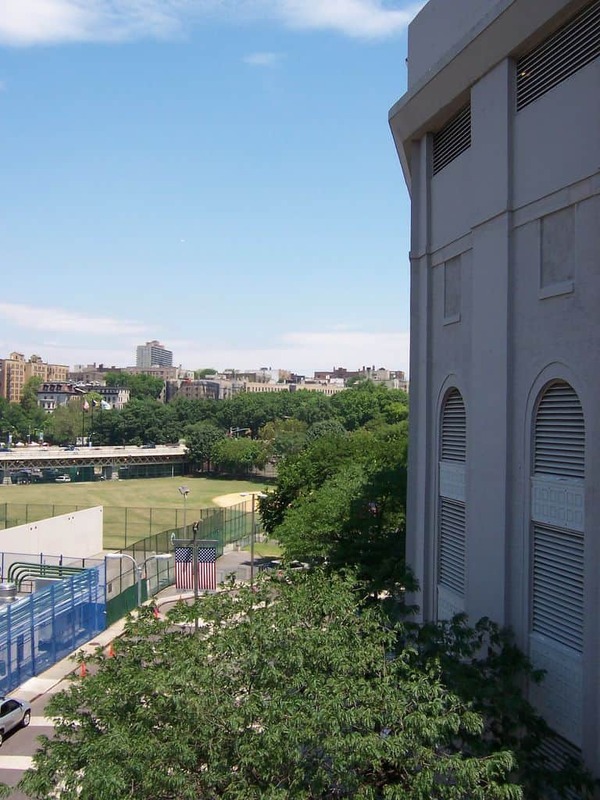 So it’s not a bad idea to give the 2008 All-Star Game to the venerable old structure in the Bronx. Give it one last hurrah. 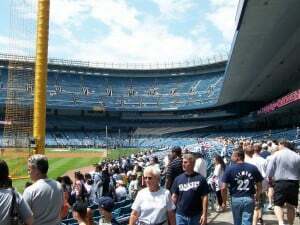 It’s not like the Yankees have hosted it once a decade; the last one in New York was in 1977, the first season after the renovation. (The Mets hosted it at Shea Stadium once, in 1964, that stadium’s first year.) Teams must request the game, and neither franchise has expressed much of a desire to have an All-Star Game in the past 30 years. The 2009 game will go to St. Louis, which just opened Busch Stadium III this past season, and you have to figure that the frontrunner for the 2010 contest would be the new ballpark in Washington, where the All-Star Game would be held for the first time since 1969. The 2011 Midsummer Classic could potentially go to the new Cisco Field in Oakland — if it is open by then. Otherwise, shortly after that year, when it is up and running. Is four or five years too soon to have it in the same area as the 2007 game, which will be in San Francisco? Possibly, though Philadelphia and Pittsburgh hosted in 1996 and 1994, respectively, with Pittsburgh of course getting it again this past season. The Twins might want it some year, if they ever get started on their new ballpark. And the Mets, should they want it, would get it sometime before 2015, showing off Citi Field, which is sure to be a gem of a facility that will quickly make us all forget about Shea Stadium.